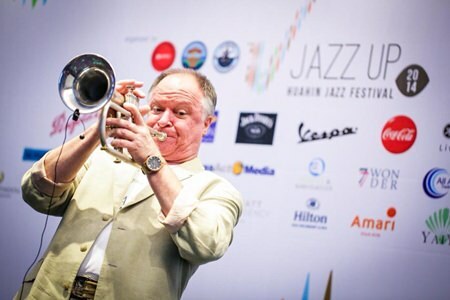 The annual Hua Hin Jazz Festival, the longest running and most well-known jazz festival in the kingdom, will take place by the beach at the Hua Hin Queen’s Park on Saturday, July 26. The twelfth running of the event will feature a star line-up of local jazz artists, including Saxophone Madness, a jam session of leading saxophonists from Thailand fronted by legendary saxophonist Tong Tewan as a special guest, and Steve Cannon, one of the most recognized trumpet-masters with his special show tribute to Chet Baker. The Hua Hin Jazz Festival takes place Saturday, July 26, at the Queen’s Park in Hua Hin. One of the highlights of the event will be the first appearance on stage together for a group of new jazz stars who proved themselves to Thai audiences through various singing TV talent shows such as The Star, The Voice, KPN and the Thailand Jazz Singing Contest. An international flavor will be provided by Japanese hip jazz group The Travelers, who will perform their eclectic mix of jazz-rock-swing and bossa-nova. Soul After Six will conclude the night with their well-known ‘sing along songs’ and featuring a collection of numbers from their new album. For more information on the Hua Hin Jazz Festival, go to the facebook web page at: www.facebook.com/officialhuahinjazzfestival2014.